Home » 4. Freebies » Printable Carrot Box by Partymazing – Free Download! I am sure, you will enjoy making this craft. Print as many pages as you need. This printable is just for your personal use. Massive Minion production is not allowed. Print the sheets using letter size paper, print in color and high resolution. 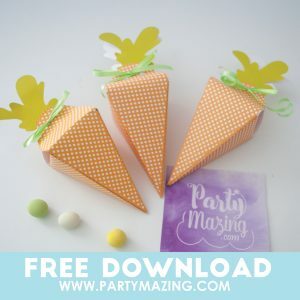 How to download the Printable Carrot Box? Proceed to Checkout. It is a freebie you won’t be asked to add any payment information. You can complement the Free Printable Carrot Box with the Free Easter water bottle labels. Download those labels in the shop for free.